Iranian Azerbaijanis have historically been considered the country’s most loyal ethno-linguistic minority. Predominantly Shiite, with religion being the most important source of collective identity, Turkophone Azerbaijanis had until the 1920s provided numerous dynasties to the Persian thrones. From Seljuks to Qajars, they stayed at the avant-garde of the Persian empires and shielded them from the major Sunni rival, the Ottoman Empire. The rise of nationalism in the 20th century gradually breached the image of Iranian Azerbaijanis as a perfectly loyal community. For a tiny group of Iran-born Azerbaijani intellectuals in the first decades of the last century, the (re)discovery of ethno-linguistic identity, distinct from Persian, upgraded the populations of the Caucasus and Anatolia to the status of brethren. This raised concerns in Tehran over the fate of the strategic northwest should Iran’s largest ethno-linguistic community seek separation from the rest of the country. These fears were heightened when in 1945, Iran’s Azerbaijani provinces were established by the Moscow-led People’s Republic of Azerbaijan. Lacking popular support, the Communist-inspired puppet republic failed to survive the Soviet withdrawal and disintegrated well before the influx of the Iranian military. A mere year of intermezzo of Iranian Azerbaijan’s de facto statehood still led the Iranian monarchy to adapt increased efforts to ensure the country’s northwest remained part of Iran. Assimilatory policies intensified in the post-World War II decades. These were aimed both at the potentially disloyal members of ethnic communities but particularly at Azerbaijanis. Masses of Iranian Azerbaijanis assimilated into the Persian mainstream. This was due to internal immigration of millions of Azerbaijanis to Tehran and the country’s other industrial areas, the lack of education in their native tongue, and certain stigmatization stemming from being a Turkophone Azerbaijani in Iran. The Islamic Revolution of 1979 initially brought about attenuation of state-imposed Persian nationalism. This was eventually replaced by the shared religion, Shiite Islam, as the ideological foundation of the emerging Republic. Yet, the situation gradually shifted during the 1980s and 1990s and Persian nationalism and assimilation policies returned to the forefront of state policies. Nevertheless, the situation in Iran’s Azerbaijani provinces had already begun to change dramatically since the early 1990s. This was largely driven by developments outside Iran. The dissolution of the Soviet Union led to the establishment of an independent Azerbaijan to the north of the Araxes River- a source of immense concern for Iranian authorities, particularly in the light of the mounting Armenian-Azerbaijani war over Nagorno-Karabakh. This war threatened to jeopardize the Islamic Republic’s security by spilling over to Iran’s Azerbaijani-majority provinces. The war also served as a source of inspiration for masses of Iranian Azerbaijanis eager to rediscover their “northern brethren” following decades of mutual isolation. In a similar vein, the economic and political rise of Turkey led many Iranian Azerbaijanis to rediscover their ethno-linguistic and cultural roots and reconsider their Turkic heritage as a source of pride. As a result, roughly over the last 25 years, many Iranian Azerbaijanis have become more proud of their unique cultural heritage. There is also an important international dimension of Iranian Azerbaijan’s ongoing transformation. There are two states – Azerbaijan and Turkey – with their dominant population ethnolinguistically and to an extent also culturally very close to Azerbaijanis. Since the establishment of independent Azerbaijan in 1991, many Iranian Azerbaijanis, particularly those of secular and nationalist mindsets, have both enthusiastic and romanticized attitudes toward very statehood of the Republic of Azerbaijan. On the other hand, the division in the first half of the 19th Century of Azerbaijani-majority territories into the Russian-dominated north and the Persian-dominated South brought about the formation of cultures that are, in many respects, antagonistic. While secularization, Russification, and strong ethnic nationalism have shaped Caucasian Azerbaijan, strong religious identity, social conservatism, and cultural Persification have been dominant in the midst of Iranian Azerbaijanis. Emphatic cultural dissimilarities between the Northern and Southern Azerbaijanis are something Azerbaijanis on both sides of the Araxes River, even those in favor of unification have become gradually cognizant of. A small, yet vocal minority of Iranian Azerbaijanis has emerged advocating for ethno-linguistic and cultural rights, such as education in their native Turkic tongue, formally allowed by the Iranian Constitution, but de facto Most of these Iran-based political activists fall short of challenging the territorial integrity of Iran. They have struggled for the acknowledgement of Iranian Azerbaijanis’ distinct ethno-linguistic identity within the borders of Iran. The extent of popular support for these groups is hardly calculable. Public manifestations, particularly those regarding politically sensitive topics, are not allowed in Iran and dissidents face harsh persecution. Those in support for Iranian Azerbaijanis’ cultural emancipation – or even for autonomy – appear to prevail in the region’s main cities, predominately within university-educated secular youth. A number of recent events, for instance, the 2006 Cartoon Crisis and the 2011 Urmiye Protests, have motivated even politically apathetic Iranian Azerbaijanis to protest. The protests have concerned what they consider state-tolerated discrimination of Azerbaijanis, a disrespectful attitude toward their heritage, as well as environmental issues. Since the early 2000s, a tiny, but visible group of secular (ultra-nationalists has emerged in Iranian Azerbaijan. This group has been concentrated in major cities, particularly in Tabriz, Urmiye and Ardabil. Often associated with the Tabriz soccer club Tractor Sazi fan club, members of this group have on various occasions questioned Southern Azerbaijan’s status within Iran, displaying determination to secede from the Islamic Republic and join the Azerbaijani Republic and/or Turkey. Similar explicitly Pan-Turkic and anti-Persian views have been propagated by various Iranian Azerbaijani diaspora groups. These organizations reside outside Iran in Western Europe and North America, and, to a lesser extent in the Azerbaijani Republic. The latter generally seeks to distance itself from expressing formal support to Iranian Azerbaijanis’ struggle and also from the anti-Iranian rhetoric from some of their representatives based abroad. 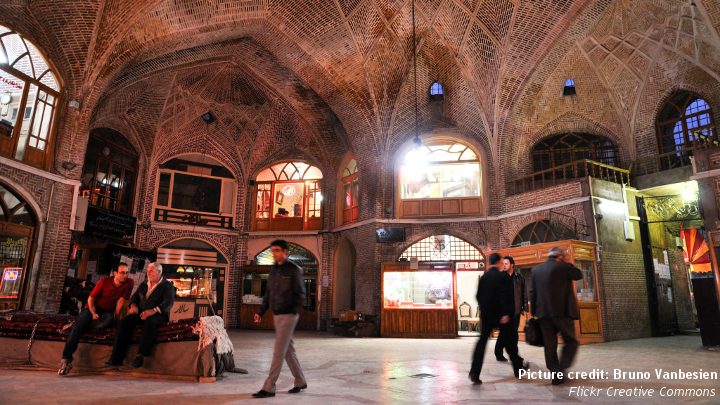 The influence of these groups in the midst of diaspora-based Iranian Azerbaijanis remains unclear as does their impact on the developments within Iran. The official position of Iranian authorities contends that Iranian Azerbaijani activists, both seeking secession and struggling to acquire ethno-linguistic rights within Iran’s borders, are orchestrated by Iran’s outside enemies for the sake of sowing the seed of public unrest to disintegrate the multi-ethnic republic. Yet, no available evidence points to the U.S.A, Turkey, Israel, and Azerbaijan being the masterminds of public protests in Iran’s Azerbaijani provinces, or having cultivated in Iran’s northwest spy networks, although there is some fractured evidence to imply that individual policy-makers in the U.S.A in the early 2000s may have had initial interest in assessing the potential of Azerbaijani separatism in Iran. Notwithstanding, due to these recent developments, many Iranian Azerbaijanis, particularly socially conservative populations residing in rural areas, appear to self-identify as Shiite Muslims first, Iranians second, and Azerbaijanis third. For them, loyalty to the Iranian Shiite state trumps their ethno-linguistic roots and regional identity. Any form of public activism for the sake of obtaining cultural rights, not least secession from the Islamic Republic, is condemned as being inspired by outside powers (Turkey, Israel, U.S.A) in order to imperil the sacred unity of their Iranian fatherland. The ongoing civil war in Syria has deepened existing divisions within the Iranian Azerbaijani population. While urban youths have expressed sympathies towards Turkey and the West and blamed the Assad regime and its Russian and Iranian allies for deliberately targeting innocent civilians, rural Iranian Azerbaijanis have shown full support for Iran’s (and Russia’s) actions in Syria. Indeed, rural Iranian Azerbaijanis have praised efforts to rescue fellow Shiites – and expand Iran’s influence in a strategically important country. The emergence of an independent Azerbaijan in 1991 shaped Iran’s South Caucasian policy for the years to come. Concerned with the negative impact of the Azerbaijani Republic on its own Azerbaijani minority, Tehran in the early 1990s was quick to align itself with Russia to prevent ambitious regional energy projects from realization as they could link up Azerbaijan to international oil and natural gas markets. The long-term trend of Iranian youth disassociating themselves from the theocratic regime and its ideology while enduring it outwardly has led to the return of nationalism within the identity of ethnic Persian. Along with this nationalism is anti-Arabic and anti-Turkic overtones. This trend has been running against a similar trend in the midst of young Iranian Azerbaijanis’ rediscovered interest in their Turkic heritage. In the years to come, the weakened appeal of shared Shiite religion and increasing disassociation from the theocratic regime may deepen conflict between both Persian nationalists and Azerbaijani Turkic nationalists. This development could pave the way for ethnically-motivated upheavals in a country that has so far affected the fate of neighboring multi-ethnic States. In the last two decades, many Iranian Azerbaijanis have deemed Turkish identity to be increasingly prestigious. This is due to Turkey’s connotation of a more liberal, modern, militarily powerful, and advanced country. The reception of Turkish (and Azerbaijani) satellite television, formally banned in Iran, has played a significant role in advancing Iranian Azerbaijanis’ ethno-linguistic and cultural emancipation. While increasingly rigorous Turkic identity – and pro-Turkish sentiments – in the midst of Iran’s (urban-based) Azerbaijani community have since the 1990s been a matter of jealousy for Persian-speakers, Iranian authorities appear to have cultivated a sense of Turkey’s covert involvement in Iranian Azerbaijanis’ affairs. Therefore, explicitly demonstrated pro-Turkish slogans, such as waving Turkish flags and shouting pro-Turkish mottos by Tractor Sazi fans, have been interpreted by Iranian authorities as being orchestrated by Turkey through the network of its agents in Iran’s northwest. The Syrian Civil War has brought additional tension to Turkish-Iranian relations. While there is a lack of evidence regarding the involvement of Turkish intelligence in stirring up protests among Iran’s Azerbaijanis, its presence in Iran’s northwest cannot be ruled out. Conflicting Turkish and Iranian interests and their increasing regional rivalry may motivate Turkey to take a greater interest in weakening the Islamic Republic from within. Washington’s troublesome relationship with Tehran has been associated with its efforts to weaken the Islamic Republic both externally and internally. The existence in Iran of a discontented Azerbaijani minority may play well to Washington’s hand. This could explain efforts by some American politicians in the early 2000s to investigate the potential for Iranian Azerbaijanis’ separatism and irredentism. Yet so far, there is no evidence of direct American interference. The U.S. lacks the capacity to instigate an anti-Tehran rebellion in Iranian Azerbaijan. Yet, due to the current trend of strengthening Azerbaijani Turkic nationalism in Iran, the situation may change in the medium-term. From the early 1990s and onwards, Russia and Iran have shared many common interests both in the South Caucasus and the Caspian Sea area. Both Tehran and Moscow have desired a weak Azerbaijan, preferably without Western orientation and isolated from important East-West energy projects. Upheavals in the midst of Iran’s Azerbaijani community, as well as any internal troubles that would weaken the Islamic Republic, are thus not in Moscow’s interest. Moscow seeks to have Iran as a strong regional and global partner. The worsening of Turkish-Israeli relations in the early 2010s has prompted Israel to place greater emphasis on a secular and friendly Azerbaijan. While Azerbaijan has acquired sophisticated weaponry from Israel, taking advantage of an important partner on the international scene, Israel has purchased vast amounts of Azerbaijani oil. The growth of Israeli-Azerbaijani cooperation has been a matter of much concern in Tehran. On various occasions, Tehran has made explicit warnings to Baku to discontinue cooperation. Speculations abounds of increased activities – and mutual rivalry – between the Iranian and Israeli secret services on Azerbaijani territory. In the final analysis, the Azerbaijani question in Iran epitomizes the growing intersection between the affairs of the South Caucasus and those of the Middle East. Those seeking to weaken the Islamic Republic are likely to continue to monitor the matter with interest; and domestic factors will ensure that it does not go away. For a long time both Qatar and Turkey have been U.S. partners in name, but provide material support to extremist groups at the same time.